"Hey, that's the one guy who used to.....when we were little"
"Didn't she always .....in high school?" "I'll never talk to him again, because....all those years ago"
I had one such thought about someone who had made a terrible decision in the past. He'd gone through all the ridicule and rumors that swirled around. I may have even been one to share some of those stories that may or may not have been accurate...I was young...I didn't know any better. I know he went through the proper legal channels and has since built a wonderful life and has beautiful children. I ran into him recently and still thought about what he did back then. Then, I allowed myself to visit with him and learn more about him than I'd ever known back then. Seems like he turned out to be a decent guy. Who'da thunk? We didn't get to talk too long, but maybe he's become a Believer. Who knows. My point is that changes we've made don't negate choices we've made in the past, but the choices we've made in the past don't define who we are, now. Is that statement circular enough? In that situation, and others, I've realized that we are all so much deeper than we appear. Are we being good God Mirrors if we join the rumor mill? 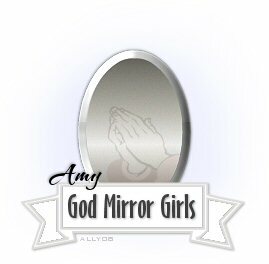 Are we being good God Mirrors if we hold those memories against who a person has become today? God doesn't forget the mistakes we've made in our lives (I don't believe), but he also doesn't hold them against us. We're made clean everyday (every minute). We need to extend that sort of grace to others. Nothing makes us any better than another. I don't want to become a doormat, but I want to get better at seeing through others' pasts and into their hearts. We should all go forth and put our judgey-ness aside. See things through the eyes of God listen with his ears. Otherwise we'll miss out on some pretty amazing people.